Version 3.6.0.0 of the compiler supports ALL of these devices FREE, just download the compiler from www.protonbasic.co.uk, NO NEED TO PURCHASE The full device list is MUCH MUCH more comprehensive, but this list of popular devices is supported without the need to buy the compiler. The Proton Development Suite represents a quantum leap forward in the development of Crownhill's core PICBASIC product. We've taken the product from an advanced compiler, to a fully fledged Development Suite incorporating not only a brand new IDE, but also a Virtual Simulation Environment — Creating what has been described as "the very best of breed" solution for working with the Microchip Technology PICmicro® microcontrollers. The Proton Development Suite is the result of a collaboration between three British companies that lead their field, Crownhill Associates, Mecanique and Labcenter Electronics. The common goal was to create a best of breed product to provide the user with an affordable, comfortable yet powerful and seamless Development Environment for the most popular microcontrollers in the world today, the Microchip PIC® MCU. Suitable for all levels of user from outright beginner to seasoned professionals writing commercial applications, the IDE/Compiler will allow you to develop your code in state of the art development environment, compile your program code and view the resulting assembly language commented with your own program code! The output of the compiler is 100% Microchip MPASM compatible and the resulting Hex file, COD, ERR and LST files can be used in with Microchip™ Compatible programming tools and Programmers. Included with the Development Suite is a fully working, highly acclaimed, Proteus Virtual Simulation Environment. 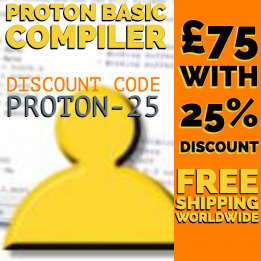 The Proteus Simulator provides near REAL TIME simulation of your code on Virtual Proton Development Boards. Proteus Virtual System Modeling (VSM) combines mixed mode SPICE circuit simulation, animated components and microprocessor models to facilitate co-simulation of complete microcontroller based designs. All this with STEP by STEP code execution for source level debugging. For the first time ever, it is possible to develop and test designs before a physical prototype is constructed.